It's Muddy Waters 200th birthday and the Thrupp boats are planning a surprise party. Keeping the preparations secret from the wise old narrowboat isn't easy. In all of the hustle and bustle Dawn Chorus' warning of an impending storm is ignored. 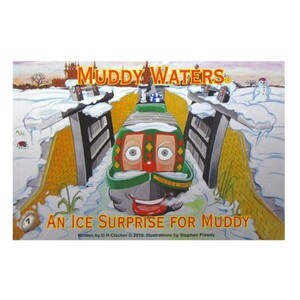 With the Ice and snow closing in on the canal, will Muddy ever get to his party at Tooley's Boatyard? 32 page paperback.